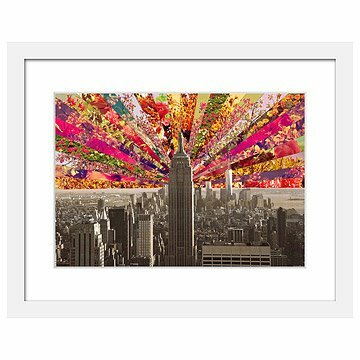 Watch the New York City skyline blossom with this visually arresting print by Bianca Green. It's no surprise that artist Bianca Green's background is as colorful as her art. Born in Rio de Janeiro, Green has called several places home, including Berlin, San Francisco, and Montevideo, Uruguay. Inspired by the power and beauty of yet another iconic city--New York--Green's latest piece honors this cultural capital by imbuing its skyline with a flourish of blossoming flowers. Honoring both the man made and the organic, this vibrant piece is printed on acid free paper, perfect for bringing a lush touch of city life to your home. Made in Berlin, printed and framed in Portland, Oregon. Bianca Green is an artist, dreamer and color addict. Born in Rio de Janeiro, she lived in San Francisco, Montevideo and now in Berlin. Biancas passion for travel allows her to get inspiration from all over the world. But she does not only travel to countries. In her mind, she travels to places that don’t have names. Creativity can get you far, so Bianca transports to paper what her imagination shows her and tries to give you little glimpses of those places without names. She enjoys combining reality with fantasy, creating images that will color your life and hopefully make you happy. Arrives framed and ready to hang in white BonanzaWood® frame, or matted in white acid free mat.